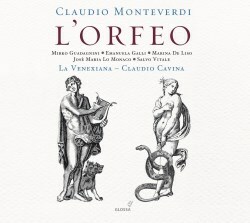 It’s now ten years since Glossa first released La Venexiana’s recording of L’Orfeo, but it sounds as fresh today as the day it first rolled off the press. They’re re-releasing it now (for the decade anniversary, perhaps?) and it gave me an opportunity to appreciate afresh just how clean, exciting and welcoming it sounds. Chief credit for that has to go to director Claudio Cavina, whose control and sense of phrasing are central to the recording’s success. Cavina’s approach is relaxed but not lazy. The scenes unfold with a great sense of beauty, and also a great feel for the developing line. However, the performance is never languid. Instead you know you are listening to a drama, and the sense of pace is very strong. There is, for example, a remarkable injection of tension, when the Messenger first enters with the news of Euridice’s death, and the regale that accompanies the denunciations of Charon helps to make that scene very arresting. The choruses bounce with energy, and the whole array of emotions that Orfeo himself undergoes comes to life wonderfully. The playing of his ensemble is also frequently remarkable. The strings caress every phrase with love, eking every ounce of meaning from their lines, while the ringing period winds and brass make the most out of their every opportunity. The brass is great in the opening Sinfonia, for example, but the cornetti also sound especially brilliant in the prelude to Act 3, and the harp-like instrument that accompanies Possente Spirto sounds fantastic. Mirko Guadagnini sings Orfeo as a tenor, but his voice inhabits that territory half-way between tenor and baritone, something that suits this part brilliantly: after all, the tessitura can fit for either voice range. This has the effect of making his voice even more enchanting, almost non-physical. It’s beautiful and plaintive as need be, but also sensually enticing. His early love scenes with Euridice, for example, are enchanting, while the duet with, say, the Shepherd after Euridice’s death is spellbinding as the voices weave in and out of one another. The rest of the supporting cast is every bit as good. Emanuela Galli sets a high standard as Euridice and La Musica. Speranza has a fruity, distinctive voice, while Charon sounds gravelly and threatening. Pluto and Proserpine manage to sound regal but also humane, and Apollo’s deus ex machina makes for a satisfying ending. Furthermore, the chorus acts as well as they sing, full of gay abandon in the love music of Act 1, then shot through with grief after Euridice’s death. The acoustic of a church suits the music remarkably well and the recording still sounds very successful indeed. To add to that, the new packaging is quietly sumptuous, with each disc given a jewel case of its own, which, with the booklet, is housed within a slipcase. The booklet still contains the full text and translations, while there is also a long scholarly essay about the chosen edition, the performance choices made, and about the impact of the piece. It’s also now at lower-mid price, so there is no reason to hesitate.